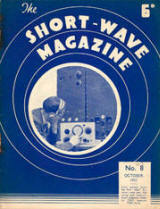 "Short Wave Magazine" originally appeared in March 1937 and published up to September, 1939 when it closed due to the onset of W.W. II. A second era began in March of 1943 and continued to 2005 when it was amalgamated with "Radio Active" to become "Radio User". Issues courtesy of Peter Merriman and David Andrews. Additional issues from John Beach. History contributed by Angus Graham. Index available for volumes listed in light yellow lettering. Click the year to open the index. The heavy clouds of war were gathering over Europe and the world when the SRORT WAVE MAGAZINE last appeared on the bookstalls. For nearly three years, gaining steadily in prestige and influence, it had been the only public periodical entirely devoted to shortwave radio. We might perhaps be· allowed to make the modest claim that during its pre-war existence the Magazine succeeded in doing much to foster and encourage the short-wave enthusiast, to help and advise the amateur transmitter and experimenter, and to assist the British manufacturer into an expanding market. We enjoyed a rising circulation and steady support from both the trade and the public. Moreover, the country gained an unseen dividend in that thousands of radio men were training themselves, as a hobby in the art which was to play such a vital part in the winning of the war. Came September, 1939, and within a few days of No. 7 of Vol. III being published, most of the staff and nearly all the regular contributors were in their R.A. F. uniforms. Two of them, the Assistant Editor, S. W. Clark (2AMW) and F. A. Beane (2CUB), a well-known contributor, will not be returning. They were among those who had to pay the full price. We mourn their loss and remember their work. records and equipment were completely destroyed, and it began to look as if the SHORT WAVE MAGAZINE might become no more than a memory. So much for the past. We are now looking forward to the future. You have in your hands No. I of Vol. IV. We hope you will like it. "flourishing trade in amateur equipment of British deign and manufacture. To our business friends, we offer the suggestion that row is the time to study and develop the home market for amateur short-wave equipment both in components and finished apparatus. the Dollar Agreement may otherwise result in American manufacturers, now waiting to export to us, capturing the market.